I thought I might put a few more Huey`s up. Some more of Carl`s little treasures. Hoping to encourage someone else,who has quite a few to put theirs up.Come on mate, get out the shed & start digging. These two are very special to me, the card says it all. Re: A few more Huey`s. That crackle effect looks awesome! nice little lures. 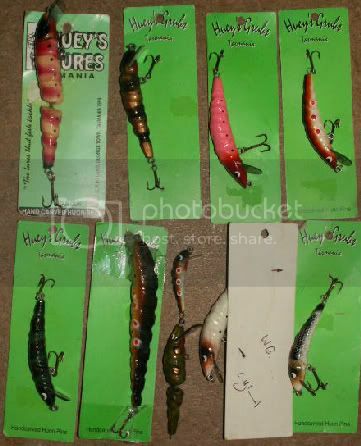 Great lures from a fantastic bloke that cover a wide variety of fish species.